“New” Fox began trading shares as a standalone company on Tuesday when the markets opened. And then its stock prices immediately began to decline. 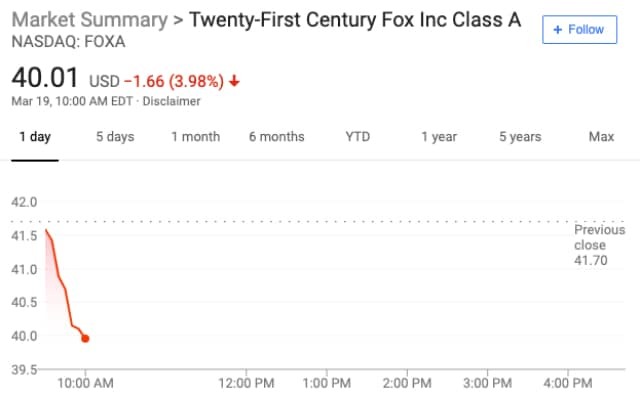 Class A shares (FOXA) opened on the NASDAQ at $41.59 apiece, Class B (FOX) opened at $41 flat. In the first 15 minutes of trading, both classes dropped more than $1 per share. Within a half-hour, both Class A and B had slipped (a rounded) 4 percent. See the 9:30 a.m. ET to 10 a.m. ET trading movement below. 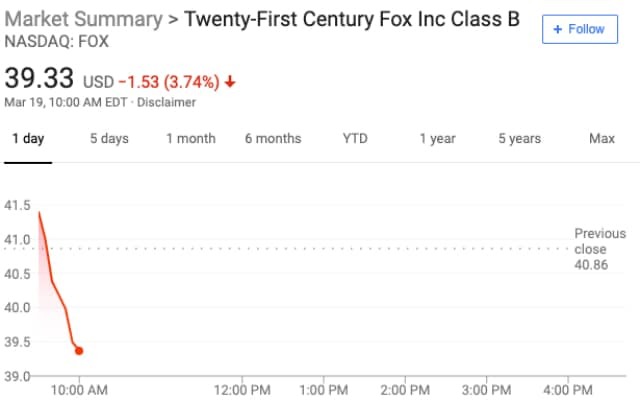 On Monday, Class A of the old company, 21st Century Fox (21CF), closed at $69.71 per share, Class B closed at $69.27 apiece. The opening numbers represent roughly 60 percent of the larger company’s closing price(s). A portion of each share of 21st Century common stock was exchanged for one-third of one share of common stock of the same class of the new corporation, per the its “standalone” announcement earlier this morning. 21CF distributed to its stockholders a total of 620,501,921 shares of common stock Tuesday morning. Shortly before the U.S. stock markets opened this morning, Fox added its former President Chase Carey, ex-House Speaker Paul Ryan and two others to its board of directors. Disney’s acquisition of many 21st Century Fox assets will become official official just after midnight.